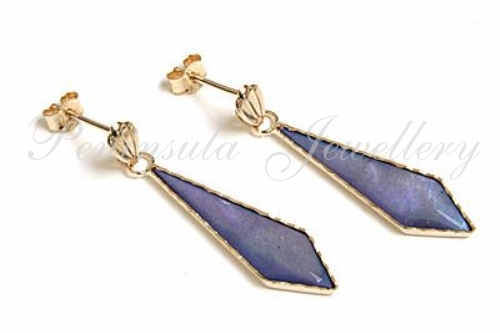 Beautiful blue Mother of Pearl earrings, elegantly simple, to suit all ages. The mounts are in solid gold with diamond cut edging to accentuate the beauty of the Mother of Pearl which has amazing lilac highlights. Dimensions: 27mm from top to bottom, 6mm wide at the widest point. Scallop fronted posts and scroll fixings in 9 carat gold. Presented in a luxury gift box. Made in England.